LITTLE ROCK, Ark. (AP) — An Arkansas House panel on Wednesday rejected for a second time a proposal to change the meaning of a star on the state's flag that represents the Confederacy, despite an endorsement from the Republican governor. The proposal was not to change the design of Arkansas' flag, but to remove language that describes a blue star above Arkansas' name on the flag as representing the Confederate States of America. Instead, that star would represent the United States of America and a blue star currently representing the U.S. would represent Native American nations. Republican Gov. Asa Hutchinson has endorsed the change, calling it the right thing to do. Democratic Rep. Charles Blake, the bill's sponsor, said he hasn't ruled out bringing up the proposal again and said it's also possible a similar proposal could be filed in the Senate. "Our state flag is the largest and most prevalent symbol we can put out to the world," Blake, who is black, told the committee. "That symbol should be an inclusive symbol. 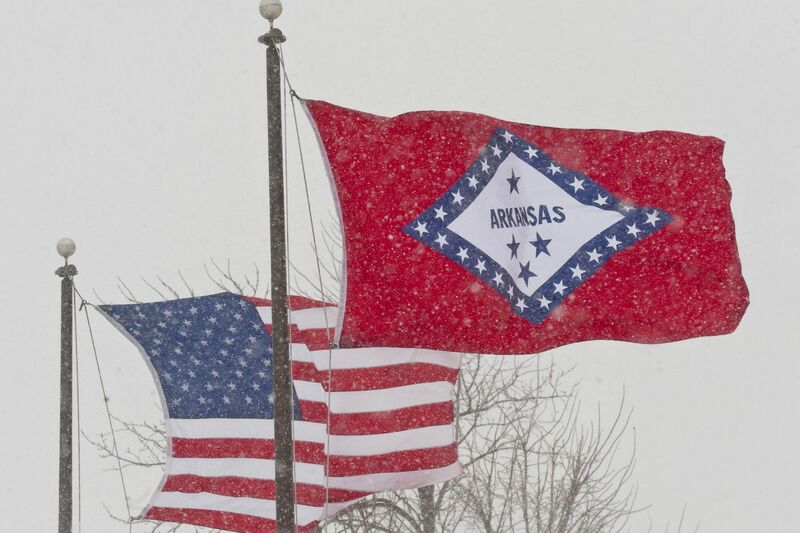 That symbol should be the Arkansas we all want to be going forward." The other two blue stars on Arkansas' flag represent France and Spain. The fourth star representing the Confederacy was added in 1923 and a year later it was placed above the state's name on the flag. Blake has said that change came at the height of the Ku Klux Klan's rise in Arkansas and other Southern states, and can be viewed as a symbol of white supremacy. Opponents testifying before the committee called the proposal an effort to erase the state's Confederate history and questioned why the Native American nations should be commemorated on the flag. One opponent, Robert Freeman of Hot Springs, said the Native American tribes that would be commemorated were "vicious, murdering savages." "Is there even one among this committee who wishes to commemorate a star on our state flag to a people who contributed actually nothing to our civil service, nor our court system, nor the formation of the state's counties and law enforcement agencies, nor the educational systems, either in Little Rock or the county seats?" Freeman, 82, who said he is a historian for the Sons of Confederate Veterans, told the panel. "I continue to support this legislation, and I am certain it will come back up for debate in future legislative sessions," he said in a statement. "My hope is that someday we can have a flag with symbolism that unites the whole state." The committee's only four Democrats and one Republican voted for the bill, while all the votes against the measure came from Republicans. "To me, that star is a reminder we never need to go back to a divided day like that and we need to continue to move forward," said Republican Les Warren, who voted against the measure. Hours after the bill failed, another Republican who voted against the measure filed new legislation that would remove the language in state law explaining what the flag's stars represent. The vote occurred two years after Hutchinson signed into law legislation he'd backed to remove Confederate Gen. Robert E. Lee from the state holiday honoring civil rights leader Martin Luther King Jr. That proposal had failed repeatedly before a House committee in the 2015 session and Hutchinson made it part of his legislative agenda two years later.